Perhaps you remember the TelexFree ad by a promoter who introduced “Aunt Ethel” by way of an artist’s rendering and accompanying narration. 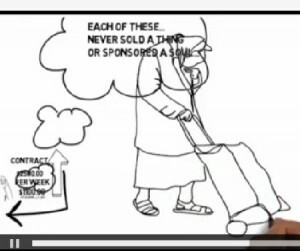 Ads for MLMs and network-marketing “programs” that depict an artist’s hand “drawing” the story are somewhat common. The ads are designed to make you want to jump right in. After all, if the Aunt Ethels of the world see the value after being introduced to a “program” by a loved one or friend, well, who would question Aunt Ethel? In a swipe at Herbalife, activist investor Bill Ackman has introduced an ad in which an artist’s hand draws the story on how to avoid pyramid schemes. One of the characters in the ad bears a striking resemblance to Herbalife CEO Michael O. Johnson. 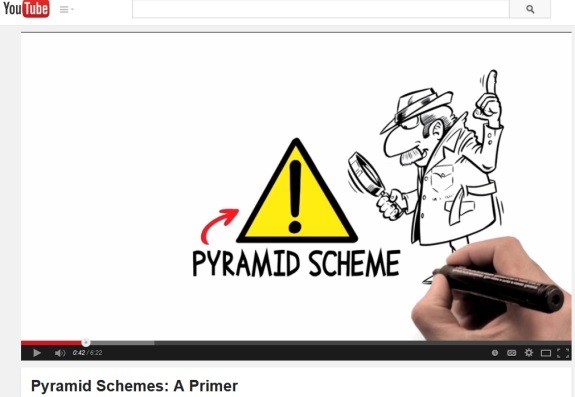 The 6:22 ad is running on YouTube and Vimeo and is titled, “Pyramid Schemes: A Primer.” A 6:27 version in Spanish also is available. From an ad for TelexFree. The SEC accused TelexFree last year of operating a massive pyramid scheme. The case is important because it demonstrates that the presence of a “product” in a scheme does not take pyramid concerns off the table. TelexFree appears to have channeled Herbalife in some ways. Herbalife, for example, called meetings “extravaganzas.” So did TelexFree. Herbalife also has been a soccer sponsor. TelexFree did the same thing. Meanwhile, TelexFree is alleged to have targeted communities whose first languages were ones other than English. Ackman contends Herbalife targets Latinos and other members of minority communities. Ackman has alleged for more than two years that Herbalife is a pyramid scheme. Herbalife says it is not.